In finishing applications, nonwovens acquire improved product properties, enhanced functionalities, and significant added value. ANDRITZ finishing systems are designed in close cooperation with leading chemical suppliers to meet production requirements for capacity, reliability, reproducibility, and efficiency. This teamwork involving chemical suppliers, auxiliary manufacturers, and customers ensures an optimum wet finishing process. Surface treatment processes by ANDRITZ range from calendering technologies (for embossing of wipes, compacting/calibrating filter materials, and perforating diaper top sheets) to hydroentanglement technologies for the softening of spunbond nonwovens. Laminated composites are also gaining importance. 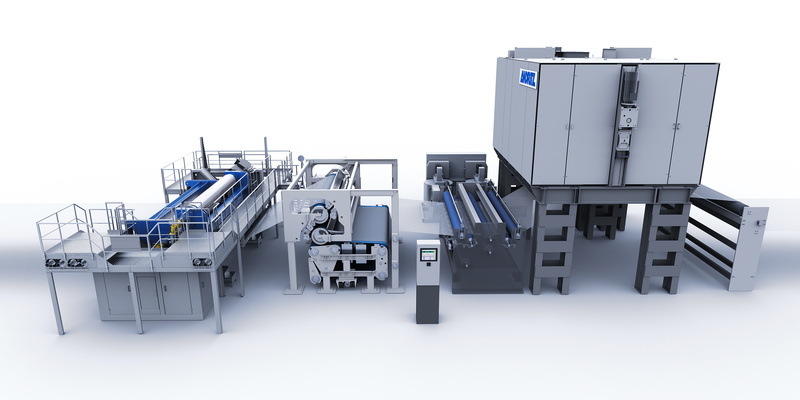 ANDRITZ offers two different calendering technologies for lamination: ultrasonic or thermal. The properties that can be achieved include hydrophilic, permanently hydrophilic, anti-static, alcohol repellent, flame resistant, and many more finishes. Our system solutions include dosing, application (low add-on/impregnation), dewatering, drying, process control, and documentation from just one source.